A Martingale Collar is specially designed for dogs that have a tendency to back out or wriggle out of traditional collars. They are considered safer than other collars and are also great for training. Martingale Collars were designed for Sighthound breeds such as Whippets, Greyhounds, Saluki's, Lurchers etc, due to them having petite heads and thin necks, which means they can easily slip out of normal collars. Even though other breeds now use Martingale Collars, they continue to be a favourite among the Sighthound owners. The Martingale Collar is designed so when your hound pulls, it gently and evenly tightens around the dog's neck without being choked, due to the 'fixed loop'. The collar tightens up to a certain point but will then not tighten anymore which prevents choking and damage to the dog's neck. Martingale Collars are made using soft material, this makes them more kind on the neck, unlike a choke collar. The collars are great for lead walking and training, also for preventing dogs from 'backing out' of their collar, which is common in fearful, frustrated or aggressive dogs. Out of the other collars available to control your dog (without using a choke collar), Martingale collars are the most popular, the most effective and also the most humane. Available in a huge range of colours, designs, and fabrics, your Sighthound will surely look the part while being safe on walks. You will need a soft measuring tape. A. Measure the largest part of the head - including ears so the collar will slip over the head comfortably. B. Measure the smallest part of the neck - this is behind the ears. C. Measure where the collar would naturally sit - usually middle of the neck. You should be able to fit two fingers comfortably between the collar and your dog's neck. Using these measurements should determine the size of the Martingale Collar you will need. Whether you have a Greyhound, Whippet, Saluki or any other Sighthound, you want your Martingale Collar to fit perfectly. Your Martingale Collar will have TWO Loops. The small loop called the 'Control Loop', this is where the D-Ring is. The other loop is the adjustable part, where you can tighten or loosen the collar to comfortably fit your Sighthound. 1. Slip the collar over your dog's head and pull it right behind your dog's ears, this is where you adjust the collar as this is the part where the collar can slip off the head. 2. When you pull on the D-Ring, the Control Loop will close. The two pieces on each side of the loop should never touch, if they do touch then this means your collar is too loose. You should be able to comfortably fit 2 fingers between these two pieces. 3. 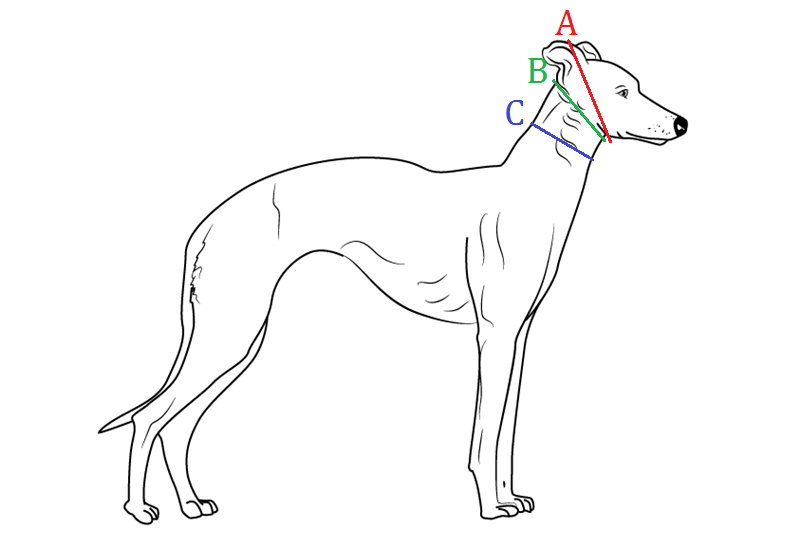 When the collar is properly fitted on your Sighthound, it should sit in the middle of the neck.